This beautiful European home combines brick, stone, board and batten siding and stucco and provides over 2500 square feet of living space. The covered porch invites you into the foyer where you'll find the dining room and great room featuring 10' ceilings and columns in the dining room. The great room has timber beams in the ceiling and a fireplace. Take the entertainment out to the covered porch with a fireplace and grill. The kitchen is open to the breakfast/hearth room and features an island bar and pantry. The master suite offers a whirlpool tub and corner glass shower and a large walk-in closet. Bedrooms 2 and 3 have walk-in closets and share a full bath. 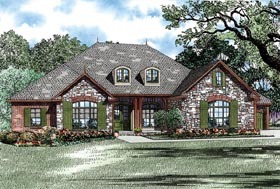 This plan also has a 4-car garage and a huge attic storage area upstairs.